Kevin Celli, director of farming at the vineyard, inspects grapevines at the winery. Willow Creek Winery is a 50 acre vineyard in West Cape May, with a new wine making facility and tasting room under construction. Thursday June 28, 2012. Willow Creek Winery is a 50 acre vineyard in West Cape May, with a new wine making facility and tasting room under construction. The winery hopes to be up and running in August. Barbara Bray-Wilde, owner of Willow Creek Winery. Willow Creek Winery is a 50 acre vineyard in West Cape May, with a new wine making facility and tasting room under construction — its plan to host weddings, though, has caused controversy. Kevin Celli is the director of farming at the vineyard. 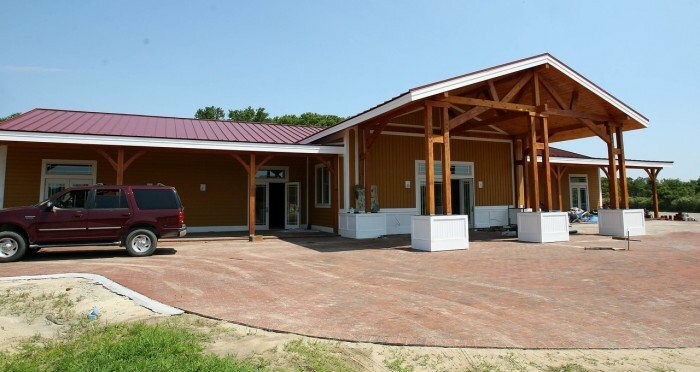 Willow Creek Winery is a 50 acre vineyard in West Cape May, with a new wine making facility and tasting room under construction — its plan to host weddings, though, has caused controversy. Kevin Celli, director of farming at the vineyard, inspects grapevines at the winery. Willow Creek Winery is a 50 acre vineyard in West Cape May, with a new wine making facility and tasting room under construction — its plan to host weddings, though, has caused controversy. Farm workers tend to the grapevines at the vineyard. Willow Creek Winery is a 50 acre vineyard in West Cape May, with a new wine making facility and tasting room under construction — its plan to host weddings, though, has caused controversy. WEST CAPE MAY — Willow Creek Winery’s plan to host weddings and other “life-celebration events” has come under attack from county and state agricultural agencies amid concerns it violates farmland-preservation rules. Set to open in August, the new vineyard is an impressive property: The 50-acre tract off Stevens Street includes the Italianate mansion that is owner Barbara Bray Wilde’s personal home, acres of grapes, 25 gardens under construction, greenhouses and a massive 12,600-square-foot building. That building — made of Douglas fir timbers with a white pine ceiling, red cedar siding, and flooring that includes ornate ceramic mosaics — is the center of a controversy extending all the way to Trenton. “The sheer size of it: That was built for weddings. When she came to us, she said she needed that area for storage and (wine) tasting events,” said Barbara Ernst, who heads Cape May County’s Farmland Preservation Program. Ernst said Wilde’s plans to host weddings is not allowed on preserved farmland. The county paid Wilde $890,000 in 2003 for a deed restriction that specifies 36 acres of the farm must remain in agriculture, including the land under the building. “She can’t do weddings. There’s been a court ruling that any life event held on a (deed) restricted farm is not being held to promote agricultural production on the farm,” said Ernst. Willow Creek Winery Director Kevin Celli argues that such events are needed to make the farm profitable. He said the plan is to host events to market the wine. By law, 51 percent of the profits must “come from our fields,” Celli said. “It costs $18 to $18.50 to produce one bottle of wine for our size vineyard, which is less than 50,000 bottles a year. We have to do other stuff. We’re permitted to do weddings and agricultural dinners as long as our product is highlighted,” Celli said. He said the farm is also experimenting with figs, cherry trees, artichokes and other farm products. Wilde, who has invested millions in the winery and said it will provide 25 jobs when it opens, argues the deed restriction prevents her only from building houses. Wilde originally had a housing development planned for the site. It came under attack locally and from the state Department of Environmental Protection due to environmental concerns. Locals were happy when she preserved the farm. “A preserved farm is not allowed to build houses but can do celebratory events. A preserved farm is still a commercial farm,” Wilde said. 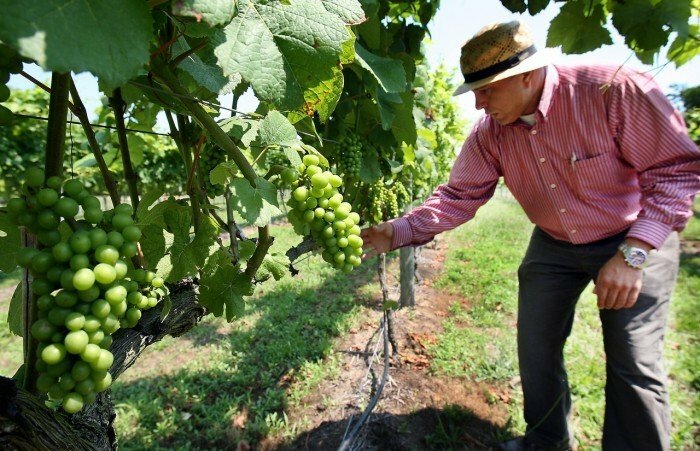 The State Agriculture Development Committee is siding with Ernst — and it is in the latter stages of a similar battle with the Laurita Winery in Plumsted Township, Ocean County. That farm was paid more than $1 million for an easement to retain to 368 acres as farmland in perpetuity. The committee alleges Laurita Winery asked permission to host weddings in 2005 and was told it was no. It alleges weddings have been held since 2009 and that brick patios, gas fire pits and an arched pergola were constructed for events. At its May meeting the committee voted 10-0 to approve a resolution directing Laurita Winery to stop hosting weddings within 30 days. Corn mazes, farm festivals and school tours are allowed, but the committee says weddings, rehearsal dinners, corporate events, luncheons, birthday, anniversary or holiday parties, fundraisers and other celebratory events are not. State legislation could decide it: Assembly bill A-323, proposed by Assemblyman Ronald Dancer, R-Monmouth, Ocean, Burlington and Middlesex, would specifically allow preserved farms to host weddings. Weddings would be allowed on Fridays, Saturdays, Sundays and holidays as long as they promote the output of the farm and agricultural tourism. The income generated must account for less than 50 percent of the “annual gross income” of the farm. It passed the Assembly in 79-0 vote in March. The Senate version, S-2074, is in the Senate Economic Growth Committee. The state Department of Agriculture is concerned about good farmland being taken out of production. “This bill could set a precedent by making it possible for a preserved farm to be used merely as a farm-themed backdrop for nonagricultural special events,” said the department’s legislative liaison Robert Vivian. Borough Commission recently passed a resolution opposing A-323. The borough has been concerned since 2006 when a magazine wrote that Willow Creek Winery — which promotes weddings on its website — would have the capacity to host two weddings at a time with up to 600 people. “This is not a tasting room. It’s an event hall. A-323 could allow over 150 events a year. ... I’m going to guess it’s going to get old,” Kaithern said. But commissioner Ramsey Geyer did not vote to oppose A-323. “Stevens Street residents are concerned with traffic and noise, which is a valid concern, but the winery is half a mile off the main road and won’t impact anyone,” Geyer said. Traffic, he said, isn’t a concern at the borough-sponsored farmer’s market on Broadway or at events at borough-owned Wilbraham Park. He said any ordinances the commission comes up with have to be evenly applied. “If you want to promote tourism and business in South Jersey, people have to come and you have to deal with extra traffic. Her objective is to sell wine,” Geyer said.